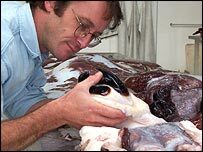 A colossal squid has been caught in Antarctic waters, the first example of Mesonychoteuthis hamiltoni retrieved virtually intact from the surface of the ocean. "All we knew prior to this specimen coming through was that this animal lived in the abyssal environment down in Antarctica," New Zealand squid expert and senior research fellow at Auckland University of Technology, Dr Steve O'Shea, told BBC News Online. "Now we know that it is moving right through the water column, right up to the very surface and it grows to a spectacular size." Mesonychoteuthis hamiltoni was first identified in 1925 after two arms were recovered from a sperm whale's stomach. "It's been known since 1925, but no one really paid any attention to it," Dr O'Shea said. "When this animal was alive, it really has to be one of the most frightening predators out there. It's without parallel in the oceans," said Dr O'Shea, whose work is sponsored by Discovery Channel. 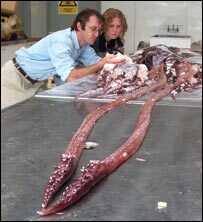 The squid researchers are calling Mesonychoteuthis hamiltoni the "colossal squid". "We'd like to give this animal the name colossal squid in order to have a common name for it as opposed to just the scientific name," said Kat Bolstad, research associate at Auckland University of Technology. "We feel that colossal conveys both the size and the aggressiveness of the animal. "This animal, armed as it is with the hooks and the beak that it has, not only is colossal in size but is going to be a phenomenal predator and something you are not going to want to meet in the water."